This untitled piece is from Buffalo artist Chris Fritton’s “Itinerant Printer” project. The project has Fritton visiting print shops around the country and using the materials on-hand to create unique pieces. This 3-color letterpress print was made at the Jaffe Center for the Book Arts in Boca Raton, FL. 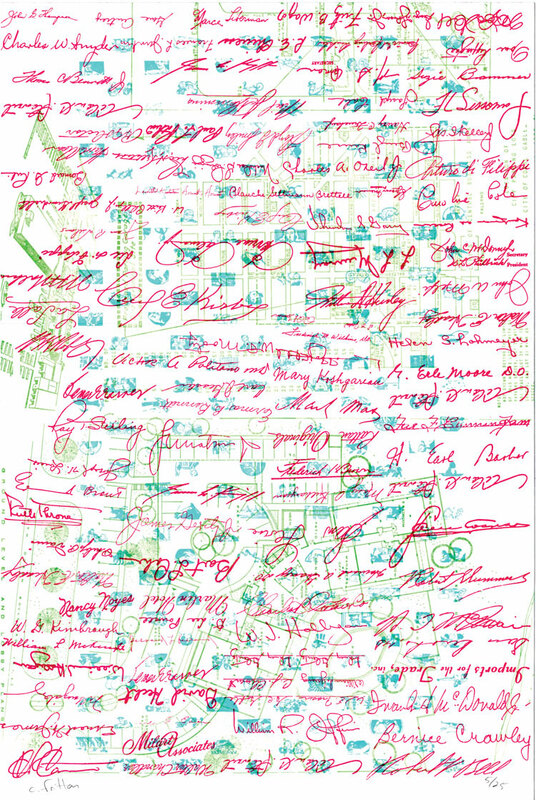 It features clip art from a local Boca manufacturer (in light blue), maps of the Boca area (in fluorescent green), and finally, dozens of defunct signatures from old Boca business letters (in fluorescent red).